Contemporary Poetry, Cross-Cultural Encounter, Comparative Literature. NY: Fordham University Press, 2012. 272 pp. To begin with, Jacob Edmond’s new book, A Common Strangeness, is anything but common and signals what I hope will be a new trend toward more ambitious studies of late-modernist to contemporary poetics on a global scale. While it might be premature to announce the arrival of a “global poetics,” there is a pressing need for a space to explore this genre specific cognate of World Literature, a space to reimagine what in China operates under the title: comparative poetics (比较诗学). This is a robust area of academic research in China, yet it tends to reduce poetry and poetics to the pre WWII traditional canon: Plato, Aristotle, and Longinus; Sidney, Pope, and Johnson; Wordsworth, Coleridge, and Emerson; Poe, Arnold, and Eliot; and perhaps Frost, Williams, Hughes, and, because it is China, Pound. In English literary criticism today, however, the term “poetics” often demarks poetry discourses consciously connected to avant-garde practice along the vectors of a more radical canon: Blake, Whitman, Stein, Pound, Zukofsky, Olson, Mac Low/John Cage to Susan Howe, Lyn Hejinian and others associated with the so-called LANGUAGE poets from the 1970s forward through neo-conceptual poetry, etc. Despite dominating critical discussions of English poetics over the last several decades, this avant-garde tradition has not found itself inside the fold of “comparative poetics” in China, and there are many reasons why it should. Of course, it should also be noted that critical studies of Chinese poetics inside and outside China are also playing catch up, and there is still so much work to be done. The current budding of critical work on the radical diversity of aborted, transfigured, and partially realized modernities sown by the hands of the so-called “Critical Review,” “Crescent Moon,” and “Nine Leaves” schools for instance are just now coming into full bloom. One should also mention that scholars tracking trends in contemporary poetics in the West have remained problematically Anglophonocentric and have largely failed to attend to poetic shifts on a global scale unless such shifts are explicitly conversant in the idioms of innovative English-based poetics (including those within the Sinophone sphere). So while no single volume could ever hope to connect the multitudinous and heterogeneous threads of a “global poetics,” A Common Strangeness succeeds in moving in this direction in part by offering a critical lens (strangeness) through which to view poetry on a global scale. Edmond argues that avant-gardists in the US, China, and Russia have all sought “to reimagine the world” by “intertwining linguistic strangeness and multiple cross-cultural engagements in ways that offer new possibilities for reconceiving literary and cultural studies” (3). He goes on to state that poets have used techniques of estrangement to negotiate our period of historical change and the perennial binaries of sameness and difference. But unlike the theorists of strangeness (Brecht and Shklovsky), they have not sought universal theories, but instead present us with techniques to presence the strangeness within discrete, contingent, historically specific language acts. And it is this subversion of the larger strategic ends of modernist universalisms that make the work of the poets he discusses such a compelling place to trace the present configuration of a global poetics. It should be noted that while Edmond does invoke the modernist theories of Brecht (Verfremdungseffekt–alienation effect) and Shlovsky’s остранение (Defamiliarization), his work is principally guided by Maurice Blanchot’s postmodern ethical formulation of the “common strangeness” (l’étrangeté commune), which “precedes the coming into being of subject and object, the same and the other, the moment when self-strangeness is recognized” (10). And Edmond reminds us that Blanchot argues it is poetry’s task to speak to this “infinite distance” and affirms that his task is to “explore how contemporary poetry deploys and unsettles representations of personal, cultural, linguistic and national difference” as it “refuses to be limited by the conceptual binary upon which even such theories of responsibility to the other are based” (10). 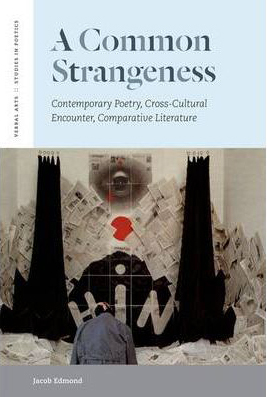 Placed within the context of Blanchot/Levinas, strangeness becomes a precondition for being human, and poetry one of the most ethical pathways toward an exploration of the infinitely complex (irreducible) differentia constitutive of such commonality. So with this argument for why poetry and contemporary poetics should matter to those interested in “world literature” in place, Edmond takes us into close engagements “six avant-garde poets”: Bei Dao and Yang Lian from China, Arkadii Dragomoshchenko and Dmitri Prigov from Russia, and Charles Bernstein and Lyn Hejinian from the US. In Chapter 1, Edmond reads the poetry of Yang Lian through the shifting dimensions of late-twentieth-century Beijing and Auckland, New Zealand, framed further by a contemporary global reconfiguration of the nineteenth century French cosmopolitan figure of the flâneur. Edmond’s notion of “the flâneur in exile” combines the Chinese exilic cosmopolitanism of figures like Yang Lian and the paradigmatic figure of European modernity as the culmination of “collision, encounter, and touch” rather than the Cold War paradigms of comparison and commensurability. By focusing primarily on Yang Lian’s Auckland based poems like “日蚀” (Eclipse), he is able to perform exquisite close readings of the Chinese originals with helpful translations drawn from his own previously-published work. His visual etymological readings of poems avoid the hyperbole of Ernest Fenollosa while still keeping an eye on interesting moments that offer themselves, such as in the title “Eclipse” which he suggests signals “a sun eaten by a worm” (38). Such playful and resourceful readings pepper both chapters on Chinese poets, revealing numerous slippages and valences characteristic of Edmond’s vision of a global poetic sutured by a common strangeness. While all the writers discussed in the book are situated within and between multiple intercultural conversations, Chapters 2 and 3 focus on one of the closest international relationships in recent avant-garde poetry—in this case between Arkadii Dragomoshchenko and Lyn Hejinian. These correspondents met in Leningrad in 1983 and remained friends through the high-Cold War tensions of the Reagan years, through perestroika, and the Soviet collapse. Due to the personal nature of this literary relationship, correspondence often takes center stage in Edmond’s analysis as he weaves letters into more close readings of poetry to elucidate the ways in which each poet serves as the catalytic other for estranging their own work. In Chapter 2, we take in the collaborative estrangement from the perspective of Dragomoshchenko’s poetry, primarily from his book Nebo sootvetstvii (Corresponding sky), which stresses both the role of correspondence in their relationship as well as the correspondence between languages and word and world more generally. In this work Dragomoshchenko presents “confused words,” “forests of symbols,” and “prolonged echoes mingling in the distance,” which do not fix meaning but rather “enumerate similarities and differences in a perpetual process of response to one another” (47). By itself, the chapter might be considered one of the weakest, but read in correspondence with Chapter 3, it provides the requisite background to better understand what Edmond argues was Hejinian’s “dream of a transnational poetic collectivity that would unite East and West under the utopian signs of Russian modernism” (153). In Chapter 3, Edmond returns to this shared site but now explores the other side of this poetic correspondence: Lyn Hejinian’s literal and textual travels to Russia and into the Russian language and poetics. Edmond shows how, over an approximately 8-year period of close engagement with Russia and Russian writers, Hejinian came upon many of her most important conceptual breakthroughs (again at the intersection of cultures and languages). In particular, I found his tracing out of Hejinian’s well-know turn away from the expressive “I” to the “person” to be insightful. In a nutshell, Edmond argues that she rejects the focus on “the self of the English language, whose definition posits it as the essence of each single human being, the sole and constant point from which the human being can truthfully and originally, speak” (77). He goes on to argue that she contrasts her sense of the English “I/me” with the Russian language and its far more dynamic and less fixed sense of selfhood. Edmond shows how Hejinian’s conflation of Russian linguistics and notions of estrangement, as forced as they may have been, proved to be a very important catalyst for contemporary poetics in English (which takes the dislocation of an expressive “I” as a central motivation). Chapter 4 shifts back to China, and to the work of Bei Dao, and to one of the main touch points of contemporary studies of Chinese poetry, Stephen Owen’s scathing review of Bei Dao’s The August Sleepwalker, which he argued represented not Chinese poetry at all, but poetry written for translation and therefore a product of global capitalism. While others have taken up this important review and it implications for Chinese Literature in global contexts, none have produced such a deft defense of the linguistic particularity of Bei Dao’s work as Edmond has here (Yunte Huang makes a similar argument inTranspacific Displacement, however). In close readings of Bei Dao’s most famous poem “Answer” and in others like “Hello, Baihua Mountain,” Edmond clearly shows how much linguistic specificity can be altered by translation and why Bei Dao’s work, therefore, must be carefully read in Chinese if we are to fully address the concerns raised by Owen. As a long-term reader of Bei Dao’s poetry, I found Edmond’s close readings refreshingly attentive to details I have always overlooked. I have questions regarding this chapter, but will address them at the end of this review. Finally, Chapter 5 shifts back to Russia, to explore the work of the Russian conceptualist Dmitri Prigov and interrogates how his work across numerous media both presenced the global cultural and ideological breadth of the Soviet imaginary but also the important role international reception plays in the establishment of cultural capital especially for conceptual work. As with many conceptual works, one does not really need to read the artifact at all to come away with a ‘reading.’ In fact, Edmond shows how Prigov’s series “Little Coffins,” which included poems sealed in coffin-like envelopes that could not be read “out of respect for the dead” encapsulates this translinguistic nature. Edmond points out that such works appealed to the exchange value, “not of words on the page, but of contemporary art operating within a globalized market system” (153). For me, it was hard to read this chapter in the context of Edmond’s triangulation of China, Russia, and the US poetics without taking stock of just how different the relationship between the conceptual art and poetry in both Russia and the US (which is to say that the two worlds have been blurred by the strong presence of conceptual poetics) and China, where the two economies and communities have remained largely bifurcated in most every way. Edmond does briefly connect the conceptualism of Prigov to the neo-conceptualism of Kenneth Goldsmith and Craig Dworkin, but he leaves the reader wondering about how his work would speak to Sinophone poetry? In Chapter 4, conceptual poetic texts/objects are deployed in ways that challenge and destabilize more normative traditions of poetry and poetics, especially those with ties to romantic, lyrical, and expressivist tendencies. Yet when we move to contemporary China, conceptualism really hasn’t produced any collective poetics along these lines. Nevertheless, the shift Edmond points out in Russian conceptualism toward “contemporary art operating within a globalized market system” does resonate. In China, conceptualism is alive and well but its producers are not called poets. Xu Bing’s work 天书 (Book of heaven) is arguably the most widely discussed Chinese conceptualist “poem” in the west, but since its author/maker does not frame his work in this way, poetry critics have not either (Chien-Hsin Tsai is presently working on this subject). While both Prigov’s “Little Coffins” and “The Appearance of Verse after its Death” bespeak the end of poetry by negating it in various ways, a similar gesture is accomplished in Xu Bing’s work because it is written alongside language but not in it. So I do feel that Edmond missed an opportunity to help illuminate the strangely recalcitrant bifurcation of art and poetry in the PRC compared to the US and Russia. In Taiwan, on the other hand, Edmond had more conceptual-leaning poets to chose from. Read against the backdrop of Sinophone poetry for instance, Hsia Yu’s book Pink Noise is extraordinarily original and has been truly generative in Chinese poetry circles, but without a critical contextualization of her work within the global flow of poetic experimentalism we are left with an incomplete reading. Read in the context of neo-conceptualism, Oulipo, flarf, and the computer generated poetry from the late 1990s forward (and the poetry of Jackson Mack Low from the 1970’s forward), Pink Noisemay seem less innovative on a purely technical level, but plugged into the aggregate sentience of a global conceptualism’s common strangeness, Hsia Yu’s poetry would become even more than what it presently is. Because of the translingual nature of so much conceptualist production, A Common Strangeness would have been a better book if it had followed the lines established in Chapter 4 back through both English and Chinese. If conceptualism is not opened up across language traditions, poets who write in this vein risk growing hypersensitive to claims of “originality” that obfuscates what is arguably the real work of their inventions: the creation of new hermeneutic spaces and epistemological and ethical encounters between word and world. A Common Strangeness comes to an end with a chapter on the American poet Charles Bernstein, one of the founders of so-called LANGUAGE poetry. Edmond picks up on a debate around Bernstein’s essay “Poetics of the Americas,” where he praises the heterodox language uses of multicultural and to a lesser extent international Englishes claiming them for what he envisions as a centrifugal (pushing out, away from a center) poetics distinct from the centripetal force of nationalism and identity-based poetic paradigms. Edmond follows Barrett Watten’s argument in his book The Constructivist Momentcriticizing the seemingly univocal/totalizing terms that homogenize differences even while it tries to open them up to greater freedoms. Edmond points to a fundamental tension between Bernstein’s vision of a “global poetics,” which rejects any “overarching universal” and his insistence on limiting poetry to “the Americas.” Edmond shows how such a move undoes the radical potential of the project by re-inscribing it within a stubbornly American exceptionalism that reaffirms claims to universality. Yet Edmond also pays close attention to the rhetorical form of Bernstein’s writing, which he argues disrupts this motion toward univocality at a structural/compositional level. By writing in “performative” ways that undermine centralized authority, Edmond argues that “Bernstein’s transnational poetics is more productive . . . [than] oscillating between global totality and local particularity . . . [because] his writing generates singular affective encounters between these poles that emerge out of the ashes of their own destruction” (179). In other words, even if Bernstein’s work does not offer us a vision for a “global poetics” at the level of its content, Edmond argues that the work’s performative nature (and form) are generative of new ways of thinking globally by bringing attention continually back to the common strangeness of local language acts. This final move reveals the author’s deep sympathy with the avant-gardist poetics he writes about and especially the agency it affords to challenging what Bernstein calls the “artifice of absorption.” Such attention to and belief in the power of presencing the materiality of signification is nothing new in English or Russian, but the way Edmond weaves these values across three language traditions reveals a significant contribution to many fields of poetic inquiry. There are a two elements that I would like to mention before bringing this review to a close—one local (to Anglophone poetics), the other global. From the point of view of this reader, Edmond has not given enough space to the work of Barrett Watten, whose work is quite important to the bridging of Russian and English avant-garde poetics (and has ties to China/Taiwan, though to a lesser extent). Watten kept popping up in my mind as I read, sometimes glanced in the parenthetical periphery or as a noticeable absence. It is easy to pick on books for not covering one poet or another, but I think that Watten’s work constitutes an important vector of the relations central to Edmond’s book. To be fair, Edmond uses “avant-garde” in its current, common usage as a catch-all for cultural practices thought to be “cutting edge,” “innovative,” and/or “radical” as defined against more “mainstream” practices, but even this usage reveals a deep imbalance within its application between countries: Read synchronically (1980s to present) the term avant-garde signals work usually opposed to what Charles Bernstein calls “official verse culture.” While the Russian avant-gardists of the same time period began writing under a very different set of historical circumstances, their work, like that produced in the US, exists in a productive tension with a strong “official verse culture.” Poetry both of the Marxist realist vein and of “mainstream” figures like Brodsky, Pushkin, Khlebnikov employed language as a transparent (if often sonorous) expressive referential idiom. So when a critic chooses to write about figures like Dmitri Prigov and Arkadii Dragomoshchenko or Lynn Hejinian or Charles Bernstein, it’s really not difficult to see why one would call both the Russian and English work “avant-garde.” In both cases, avant-garde work existed alongside a strong mainstream tradition that it challenges for various reasons in various ways (often through poetic acts of estrangement and foregrounded materiality etc.). While Bei Dao and Yang Lian (and Duo Duo, whom Edmond also discusses) are “avant-garde” because their work is oppositional and decidedly experimental within their historical contexts, there is an important difference. The work of the so-called “Misty” poets displaced what passed as “mainstream” before them, and this happened in a way that no other avant-garde has come close to in the US and USSR. The reasons for this are complex: perhaps most important, the unprecedented blooming of poetry in the 1980s inspired by Bei Dao and others did not overthrow a longstanding vernacular tradition with centuries of metaphysical and aesthetic inertia. Instead, vernacular Chinese poetry was still in its infancy and, simply put, what passed as “official verse” during the Mao era cannot hold a candle to its Western counterparts in the US and Russia. So can one apply a term like “avant-garde” if one cannot apply its differential signifier “mainstream” equally to each habitus as well? Rather than belabor the point, let me end by drawing out what I find most pertinent in this question—If we apply the US/Russian rubric of an avant-garde to China (aesthetic estrangement), only a couple of poets strongly suggest themselves—like the poet Che Qianzi. A closer look at the work of this poet, however, suggests a “strangeness” quite “uncommon” to its western counterparts, however. Many of the avant-garde technologies that inform his experimentalism have been acquired from his familiarity with innovative Western poetries as well as from his friendships with poets like J. H. Prynne and others, but his poetics reveal deep cosmological and classical Chinese poetic and calligraphic impulses radically distinct from American, Russian, and other transpacific poetics. When I asked Che if he could sum up his poetics for me, he gave me one sentence: 汉字是我的上帝 (Chinese characters are my God/Supreme Deity). This one statement alone confounds any attempt to locate it within the common strangeness of those included in Edmond’s book. To explore work of this kind, one would want to approach poetics within the broader context of comparative philosophy in an attempt to expand the membrane of the strange to allow for still greater heterogeneity. It is my hope that terms like avant-garde can be deployed contingently to tease out both the tensions within intralingual poetics (like Sinophone or Anglophone specific studies) but also between language specific traditions by foregrounding the ways in which received terminology must be re-cast to better address the complex colorations of the muddy transpacific estuary of late-capitalist Buddho-Daoist poetics or poetry that challenges normative local discourses grounded in class, gender, sexual orientation, migrancy, ecology, and otherness on a global scale. So in the end, a confession: despite this embellished final line of critique, I am less interested in how one classifies the differentia of global poetic practices, as much as I am interested in stressing our critical vocabularies to a point where they become more capable of presencing the radical socio-historical-aesthetic heterogeneity of a “global poetics,” and let there be no doubt, Jacob Edmond has conducted a number of helpful stress tests in A Common Strangeness, and I hope others will follow.